Why Is Bone Broth Such A Super Food? Homemade broths are one of the most powerful gut healing superfoods. 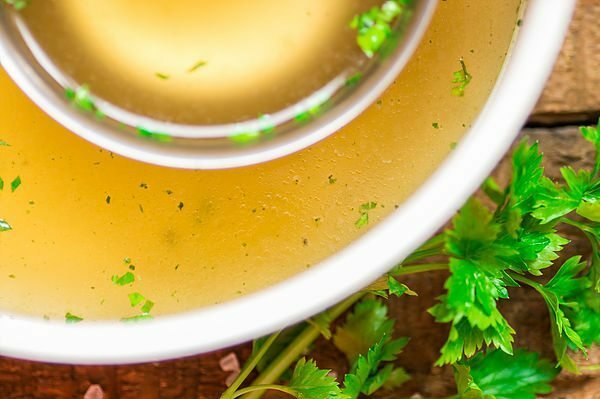 This clear broth is made by cooking organic beef or chicken bones in water for up to 48 hours in a slow cooker, this releases a number of health boosting nutrients into the broth. It contains essential amino acids Glycine and Proline: which are particularly important as they enhance gastric secretions, repairs damaged mucous membranes and helps the liver to detoxify. Gelatine and Collagen: Bone broth produces a rubbery nutritious gelatin when cooled. Symptoms of collagen deficiency include poor wound healing, bleeding gums, and bruising. Calcium is necessary for healthy bones, muscle contraction and relaxation, proper clotting and tissue repair, normal nerve conduction, and endocrine balance. Calcium deficiency includes symptoms of osteoporosis, brittle nails, periodontal disease, muscle cramps and spasms, palpitations, depression, insomnia, and hyperactivity. Phosphorus is necessary for the generation of energy in the body. A deficiency in phosphorus can lead to symptoms such as fatigue, weakness, muscle weakness, celiac disease, osteomalacia, and seizures. Magnesium is the most common dietary deficiency. This mineral is involved in over 300 enzyme reactions, is a cofactor for vitamins B1 and B6, and is involved in the synthesis of proteins, fatty acids, nucleic acids and prostaglandins. Proper nerve transmission, muscle contraction and relaxation, and parathyroid gland function are dependent on magnesium. When making bone broth at home make sure to use good quality ingredients. I prefer to use organic chickens and veggies, especially since I don’t peel the carrots, onions, and garlic. Their peels have lots of nutrients that can contribute to the healthy profile of the broth. It’s best to cook low and slow. A slow, low heat is the healthiest way to extract the nutrients from the chicken bones. It takes a good 24-36 hours in the slow cooker. So now you know the many health benefits I’m sure you want to know how to make it. Below i’v added my own recipe. Step 2. Roughly chop the celery & carrots into 1-2 inch pieces. Leave the nutritious peels on the carrots and leafy ends on the celery. Step 3. Roughly cut the onion. Leave the skin on–it has valuable nutrients. Plus, the skins add rich color to the broth. Step 4. Cut the entire garlic head in half crosswise. As with the onion, you should leave the peel on, because it has health boosting nutrients. Enjoy 1-2 cups daily or make delicious soups/stews or use to braise vegetables/ meats or for boiling rice. This entry was posted in Digestive Health, Healthy Benefits Of Foods, Immune Health, Mental Health, Natural Medicine, Recipes and tagged #digestion, amino acids, bone broth, calcium, chicken bone broth, collagen, gelatine, glycine, gut healing, healing, leaky gut, magnesium, phosphorus, proline, super food.